Caregivers can often distinguish between normal occasional forgetfulness or lapses in concentration and the onset of Alzheimer’s Disease. According to a Washington University School of Medicine study in 2010, family and friends start to see warning signs with even more reliability than cognitive screening tests administered by professionals. People who are closest to an individual interact with that individual more often; these loved ones and caregivers are frequently in a position to observe patterns of odd or changing behavior. They would also discern telltale personality changes, as well as anxiety or withdrawal. Sometimes elderly or even middle-aged people exhibit symptoms similar to Alzheimer’s, the causes of which are not the onset of Alzheimer’s. Stress related to worry and anxiety, depression and insomnia can cause forgetfulness and lapses of clear thinking. Also, some medications are well-known for causing “foggy-brain.” These symptoms go away when the stress is alleviated or when the affected person finds relief. Like-wise, the symptoms of foggy brain vanish when the medication is discontinued. Restoring regular patterns of restful sleep will also reverse jumbled speaking and thinking. Spotting true symptoms of early-onset Alzheimer’s requires filtering out behavior related to these and other causes. 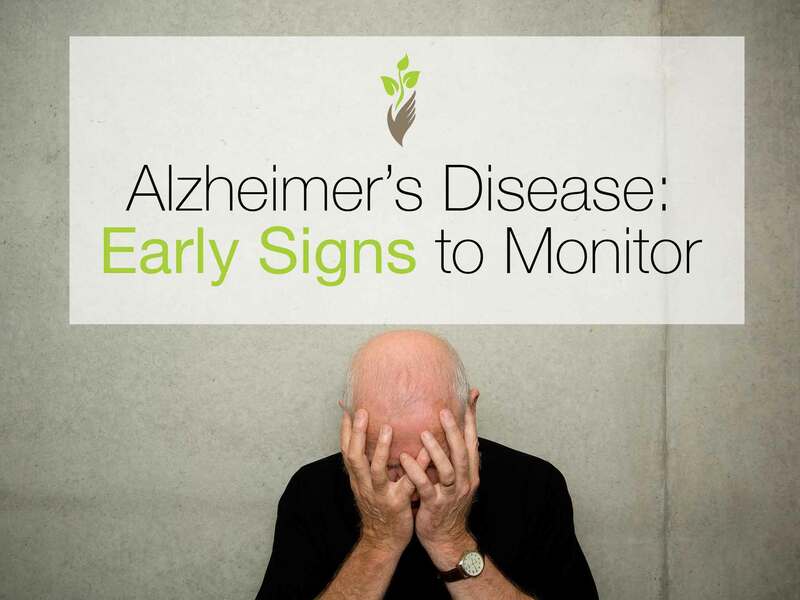 What are some of the more worrisome signs of Alzheimer’s? Here are at least 5 different types of behavior that a caregiver can identify. Difficulty with Finances. Probably the first evidence of Alzheimer’s are constant mistakes in handling money and finances or difficulty making decisions in this area. Difficulty Concentrating. Furthermore, Alzheimer’s victims have difficulty in concentrating and following directions. They have trouble reading, writing, and learning or even following a recipe. Lose or Misplace Things. Alzheimer’s causes those affected to lose or misplace things with increasing regularity. Often they will search for something that they have lost, and then forget what they were looking for as well. A key sign is when possessions are put in odd places, e.g., keys placed in the microwave. Housekeeping Deteriorates. People with Alzheimer’s are more likely to hoard things that have little value such as old newspapers and magazines. Housekeeping skills which used to be admirable begin to slip and deteriorate. Forget People. A litmus test for detecting Alzheimer’s is the ability to remember people. Not just names, but actual people. Forgetting someone’s name when a person has just been introduced is a common error, or when you forget someone with whom there has been very little personal interaction. But when one cannot remember someone special in a face-to-face encounter, that’s a heralding sign of Alzheimer’s. There are other early signs such as mood changes, difficulty in having conversations, and social withdrawal that may occur. Clinical tests provided by a professional in a health care setting are usually definitive but these above-mentioned signs are indicative of the early onset of Alzheimer’s disease and can be observed by the caregiver. The sooner Alzheimer’s is identified, the sooner you can move to seek help and that is of utmost importance. For more resources visit Preferred Care at Home’s Family Learning Center for free online modules for family caregivers. For information about senior home care, contact a location near you.